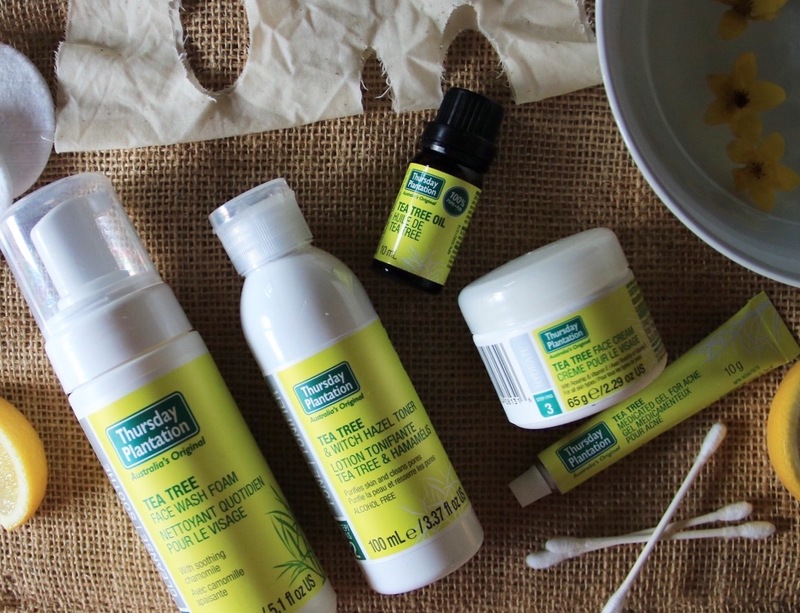 Two months ago I was given a PR package of Thursday Plantation 100% pure tea-tree oil skincare products to test out and review. I wanted to give my honest opinion and see how my skin did with this product before standing behind it. 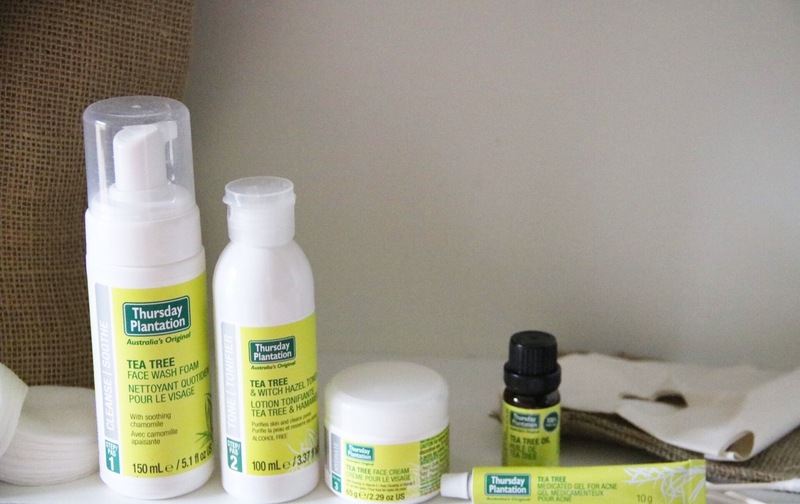 After a few months of continual use, I can now say how much I enjoy Thursday Plantation’s natural products and I will definitely be continuing to use them in my everyday skincare routine. 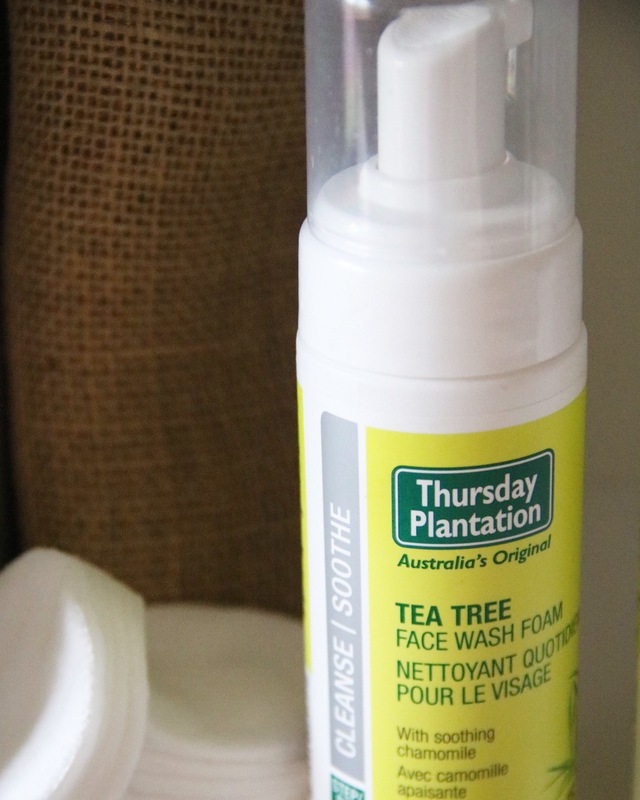 It is so important to look for products that contain 100% natural tea-tree oil, and Thursday Plantation products are backed by that guarantee. For starters, it should be known that I have very sensitive skin, minor dark spots from acne and the sun and frequently some pretty pesky pimples! I’ve struggled back and forth with my skin for as long as I can remember, and now that I’m in my mid-twenties I’m really searching for any remedies or solutions for my acne. On a scale of 1-10 I would say my skin is between a 4-5 on the severity level, but with casual flareups of some pretty bad pimples that leave even worse scars behind. Luckily the scars that I have are not raised and have not left pin-holes or craters but I’ve really not been happy with the dark marks and dry patches. I have tried pretty much every prescribed acne medication on the market, except for Accutane as I was a little scared away from that and didn’t think my acne required that strong of a treatment. So off the to drugstore I would go, picking up all of my prescriptions, and then every other type of acne solution (priced low and high) that you could think of. My biggest problem really I think is my dry skin which I have had my whole life. I seem to find that when I get that under control the acne is a little less prevalent. But, then I sometimes run the risk of it becoming too oily and then I’ve started a home for acne once again. 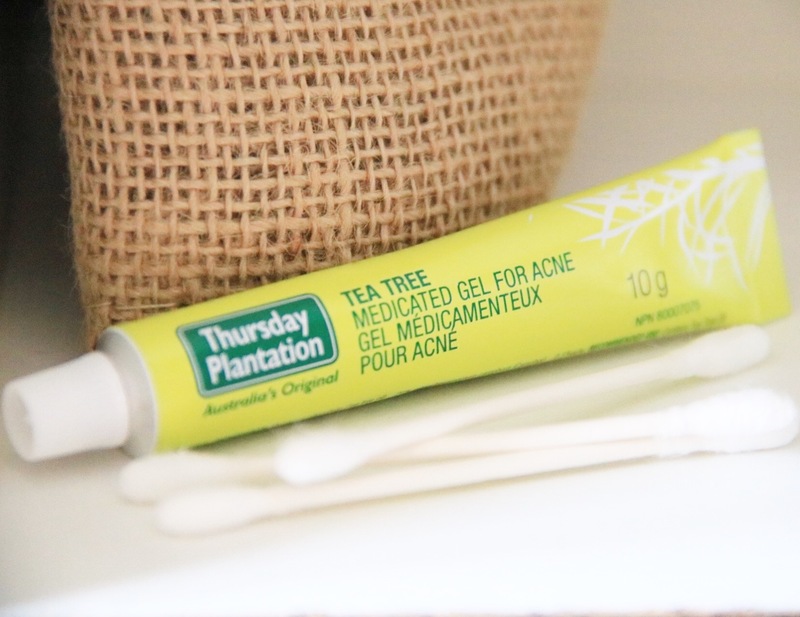 Thursday Plantation uses the fighting antibacterial powers of 100% natural Tea Tree Oil in this specific line of products to combat acne. 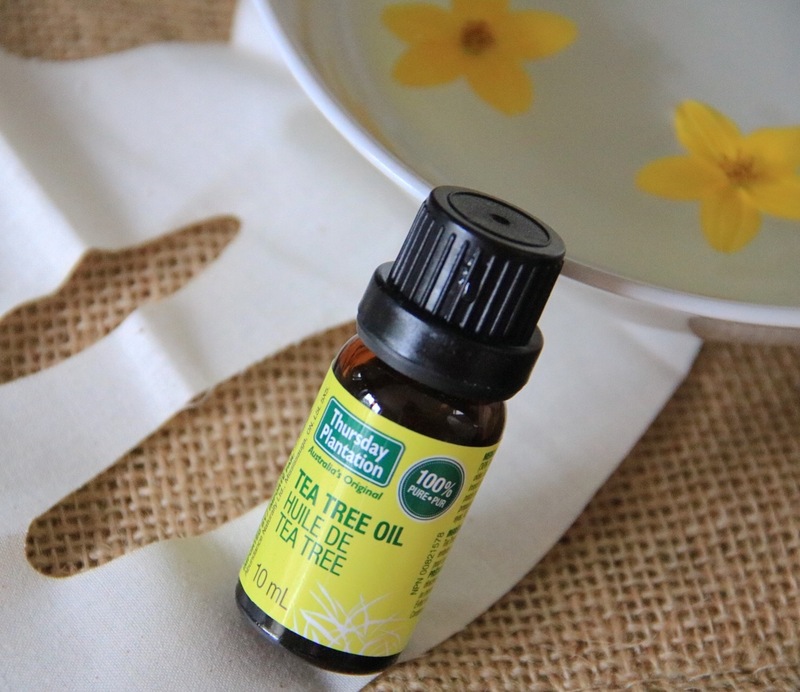 Tea tree oil has long been known for treating minor cuts and scrapes, sooth dry flaky scalps, psoriasis and eczema, toe fungus,, and even as house-hold cleaner. The list of its uses really can go on and on. The natural 3-step skincare regime is easy to follow and helps in maintaining your healthy skin and new clear complexion. You can smell the natural ingredients and they’re so refreshing (unlike a lot of medicated treatments). The products are so fragrant and familiar to what you would smell in a spa! 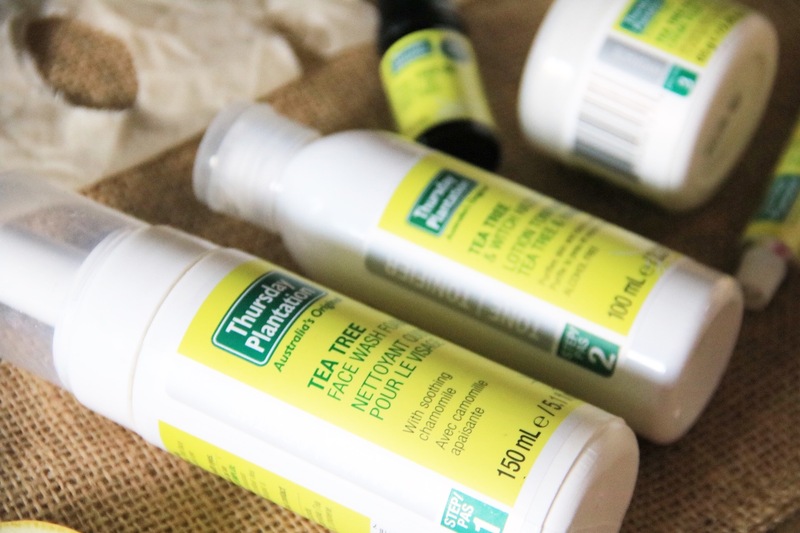 The first range of products in the program is the tea-tree oil soap-free foam cleanser. It is strong enough to remove dirt and makeup but didn’t make my face feel clogged or dried out. 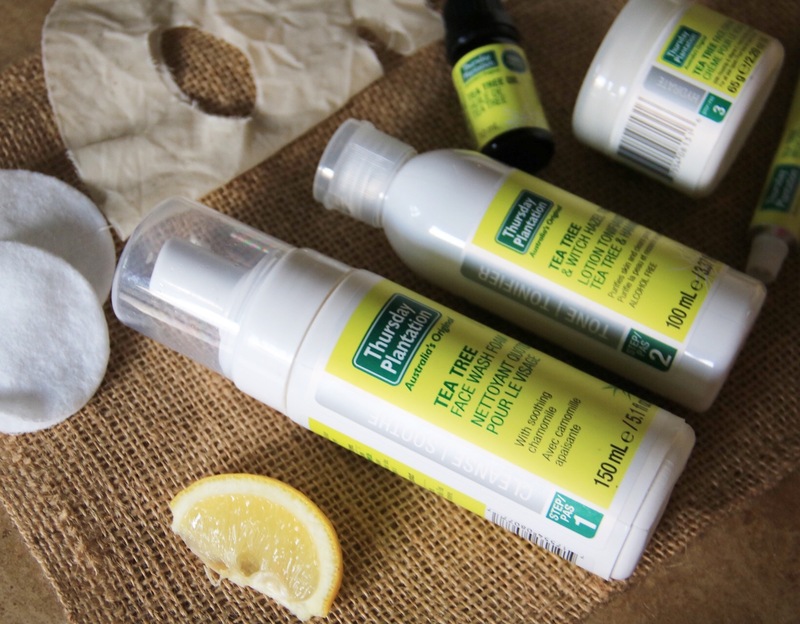 Without the use of harsh chemicals, this natural cleanser left my skin feeling soft and thoroughly cleaned. 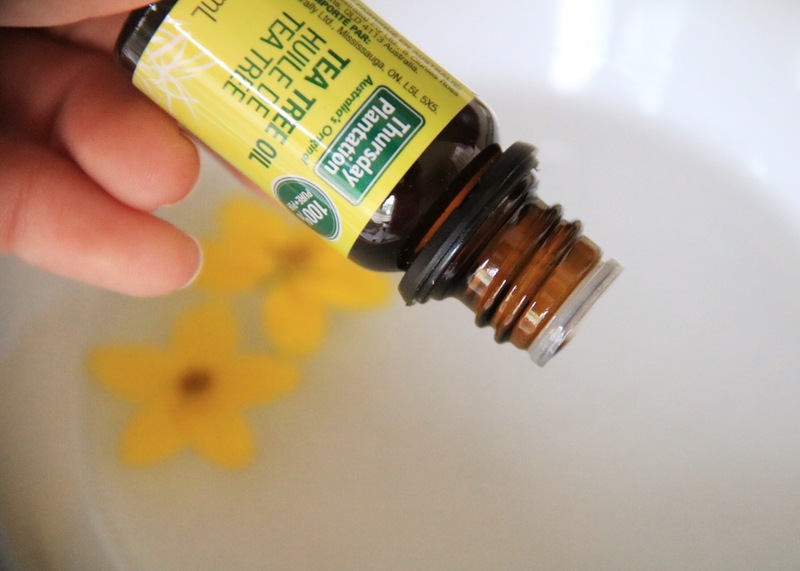 The added Chamomile ingredient helps with redness of the skin, something I am personally very prone to. I do however recommend still removing your eye-makeup with a gentle cleanser first. 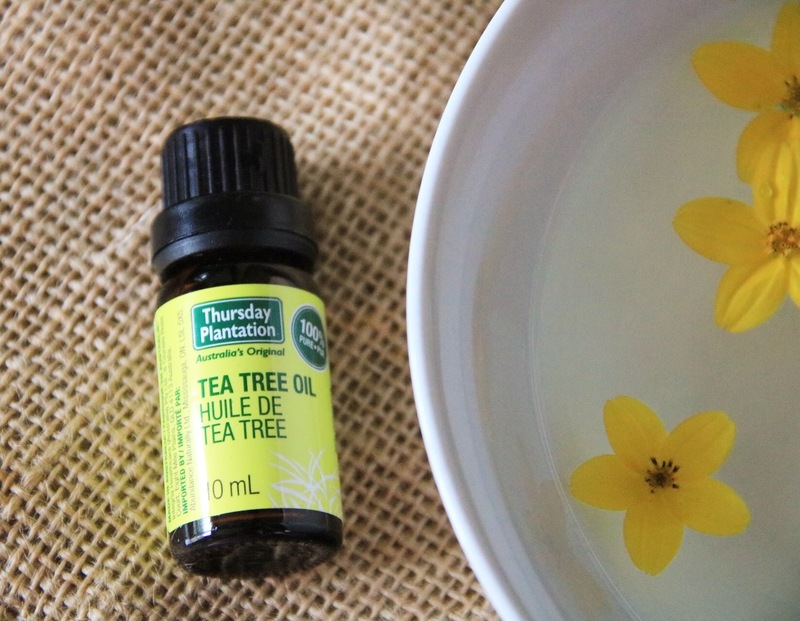 Step 2 is Thursday Plantation’s Toner with Tea Tree & Witch Hazel. 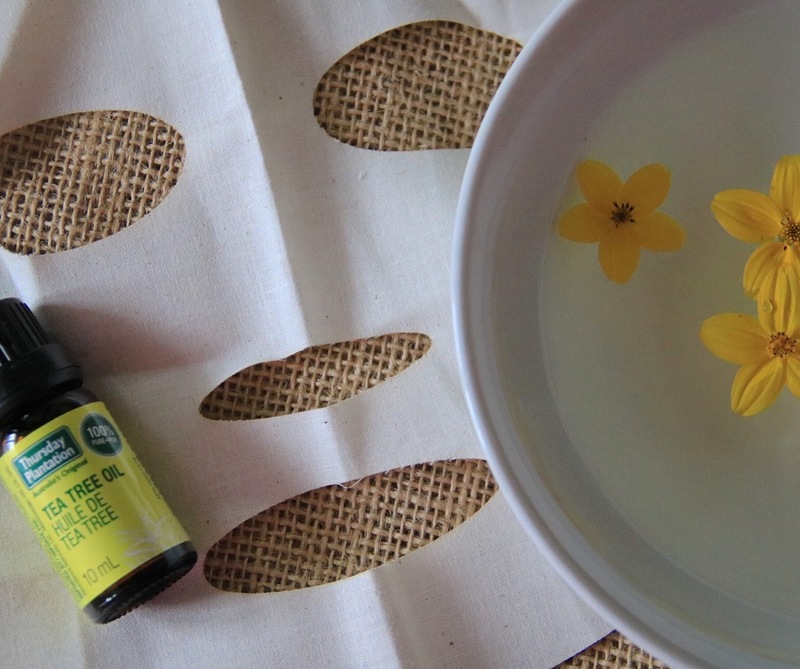 The tea tree oil acts as an antibacterial agent, while the witch hazel tones and purifies the skin by tightening pores without drying out your skin. I have a heard a lot of good things about witch hazel for helping with redness and inflammation. I use this toner after I’ve gotten my eyebrows threaded, and it helps to decrease the inevitable redness and also little bumps that could surface afterwords. I have found out the hard way in the past that not using a toner, I will get almost little pimple-like dots around the area of my eyebrows that have been threaded. There is also calming lavender and aloe vera that helps sooth the skin. I love using toner after my cleanser and it helps removes any excess dirt or oil it may have missed! I have just recently added toner into my daily routine and can’t believe I hadn’t been using it until now. 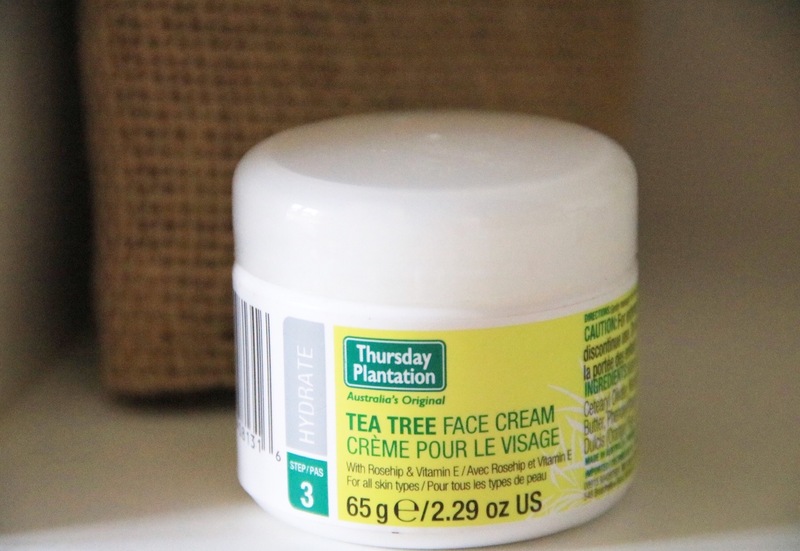 The 3rd step in this skin treatment program is the tea tree face cream with rose hip. The cream itself feels very light weight, however, it does take a little bit for your skin to absorb. I use a daily tinted moisturizer and find it hard to apply if I don’t give the Thursday Plantation cream some time to soak in. Moisturizing your skin is extremely important and is particularly crucial after washing it! While cleansers can help remove dirt and oil, they can also cause your skin to dry out, and for some, dryness causes acne. Maintaining your skins natural moisture balance is the key to maintaining looking skin! The medicated acne gel is in addition to the 3-step process. I don’t use it everyday, just when I spot a pimple that I can hopefully treat by drying it out before it gets worse, or leaves a dark spot. The gel comes out clear which is great if you want to apply during the day over your makeup! For best results, use a small amount in the morning and at night.The gel works for treating whiteheads blackheads and other pimples. Unlike a lot of other medicated acne treatments I have tried, this one doesn’t have harsh chemicals that burn or irritate my skin causing it to really dry out and starting the vicious cycle of acne brought on by dry skin. Ingredients: Melaleuca Alternifolia (Tea Tree Oil) 20% w/w, Cinnamomum Camphora (Camphor) 0.5% w/w, Water, Carbomer, Polysorbate 60, Isopropyl Myristate, Triethanolamine. I was also given a reusable mask, and a bottle of 100% tea tree oil. For my mask, I followed the easy instructions provided in the kit, but feel free to get creative! 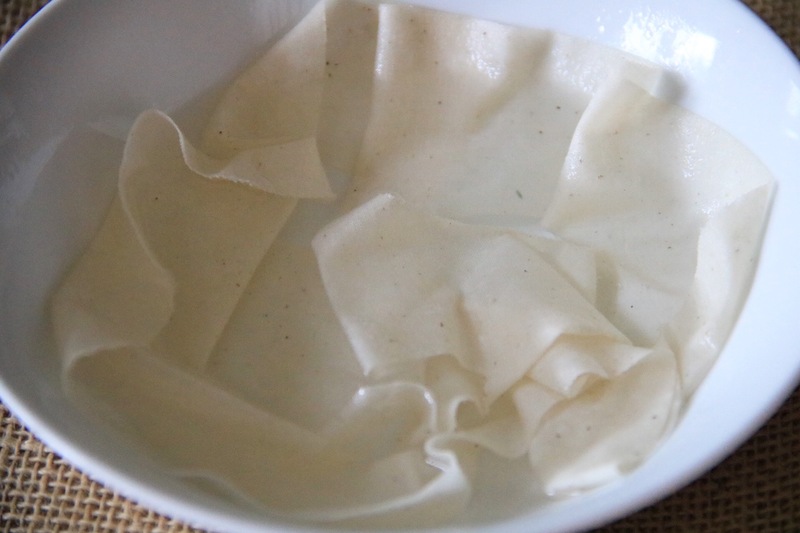 I added a few drops of tea tree oil, and a little bit of raw honey (antibacterial agent) to distilled water and soaked the reusable mask in the treatment. I added a little bit of fresh lemon juice (helps brighten skin). 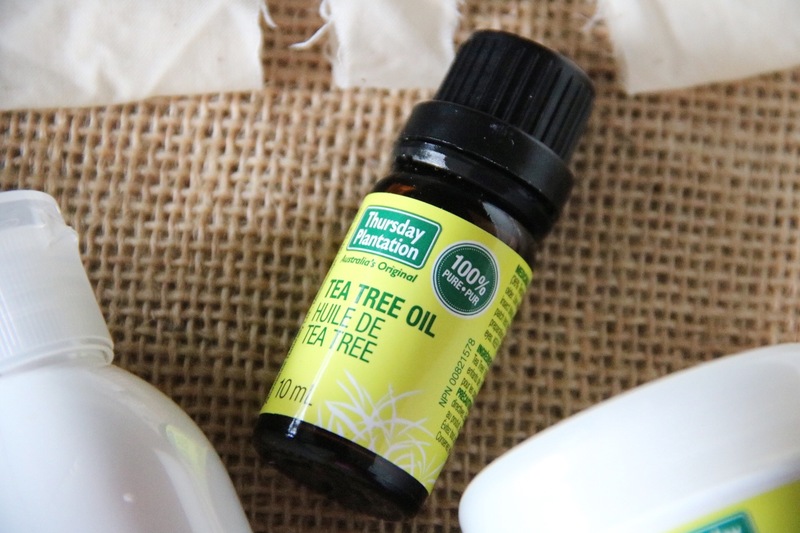 You can look up other face mask solutions that include tea tree oil in them! The smell is so refreshing and relaxing, it’s very calming. Apply to your skin and leave on for approximately 15 minutes. Upon applying the mask, I noticed a little bit of a burning sensation around my eyes, so I simply shifted the mask away from my eyes and it was fine. After removing the mask my skin felt so soft, and not dried out or stiff at all! I did a quick rinse (with water only) and then patted it dry with a clean towel. So far I am really happy with the results of this product. The product is easy to find in local stores like Walmart, Loblaws, Rexall, well.ca, natural food stores, etc. The best part is, buying these won’t break the bank. Each of the products range in price, and are all under $20.00!